Today is my last day of finals & then I am home free! I have Christmas cookies on the brain because I will be baking up a storm when I go home. I put this recipe up on Meghan's blog a while back when she & I switched for the day. Since her readers got to see one of my favorite recipes I wanted to share with my readers too! Everyone who knows me, knows that I am obsessed with peanut butter. So it's not very surprising that peanut butter cookies are my favorite. I have two different recipes that I use for them: one for basic old fashioned peanut butter cookies with the fork criss cross & the other is the one I am going to share today. This is a recipe has a little something extra because you add Hershey Kisses. -Heat oven to 375 degrees. -In a bowl stir together flour, baking soda & salt. -In a separate bowl, beat the shortening & peanut butter until well blended. -Add the white & brown sugars, & beat until fluffy. -Add the egg, milk & vanilla, beat well. -Gradually beat the flour mixture into the peanut butter mixture. -Shape dough into 1-inch balls, & place on ungreased cookie sheet. -Bake 8 to 10 minutes or until lightly browned. -Then remove the cookies from the sheet & transfer to a wire rack, allow to cool completely. These cookies are delish, & combine two of my favorite things: peanut butter & chocolate, double win! They are so yummy that when I make them I have to give some away so I won't eat them all. They are sure to impress at any holiday party, cookie exchange, or even as a cute gift. My favorite cookies are chocolate chips, but sugar cookies are a close second! I've never made cookies from scratch, but this seems simple enough for a non chef like me, lol. I love those cookies. Great idea to use the heart shaped kisses! My mom makes cookies just like these and they are my favorite cookies each year! PS I love your graphic on the right side of the page --- so cute!! Ridiculous. I want one. Now. Oh my gosh, these are sooo cute! I've never thought to use hearts. 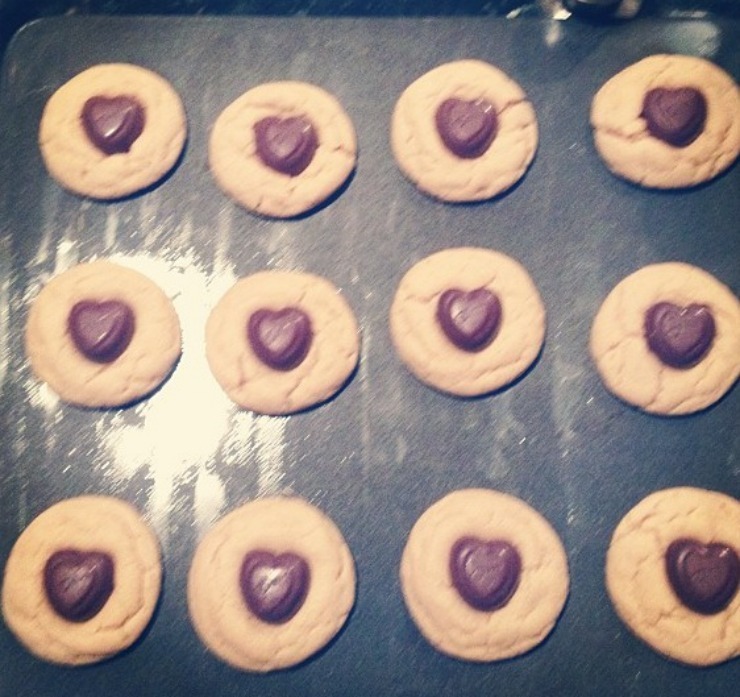 Looove pb cookies. I've tried substituting coconut oil in chocolate chip cookies but it definitely changes the consistency and there was a film of oil leftover. I think coco oil works best in desserts like cakes or cupcakes. Maybe half shortening and half coco oil would work though?? At my college, there's a company called Midnight Cookies. They bake fresh cookies to the order, and will even deliver them with milk! My favorite cookie is their Midnight Cookie (aka The Quadruple Chocolate Cookie). I'm a total chocohalic! Looks delicious! My favorite cookies are anything that satisfy my inner choco-holic!